Prudence’s style of freeform usually involves combining small pieces of knitting and crochet into patches (scrumbles), which can later be joined together to form a unique and extremely tactile fabric. Freeform doesn’t follow a written or charted pattern, although templates (in the form of paper patterns) could be used to obtain a good fit when using freeform patches to create garments. Freeforming enables you to create as little or as much as you want in any one sitting. Freeformed fabrics can be full of texture and colour, and can be used to make a wide range of items such as clothing, handbags, hats & jewellery. Visit the photo gallery for more ideas, or check out some of the tutorials if you feel that you need a little help to get you started. As illustrated above, a scrumble can be started by knitting or crocheting virtually anything at all – thin one begins with a small knitted square. Now add something else onto it – say a few random crochet stitches; then add something else again – maybe a small crochet shell. Now use your knitting needles to pick up a few stitches along any edge, and knit a little bit more…and then make another small addition somewhere else. Next you could perhaps crochet a separate, circular crocheted motif… and attach it into place with a few crochet slip stitches…then maybe add another (or many). Now knit another section directly onto the patch, or add another different crochet motif…then fill in some gaps, or work a few fancy stitches, in both crochet and in knitting too. Of course, not all freeform pieces need to follow this exact formula. For lots of other ideas on how different shapes and stitches can be combined, see the Scrumble A Week project below, and also check out Prudence’s Gallery for close-up’s of freeform fabric, lots of freeform garments and many other unusual creations. For inspiration on grouping together yarns for a freeform project visit the Yarn page. 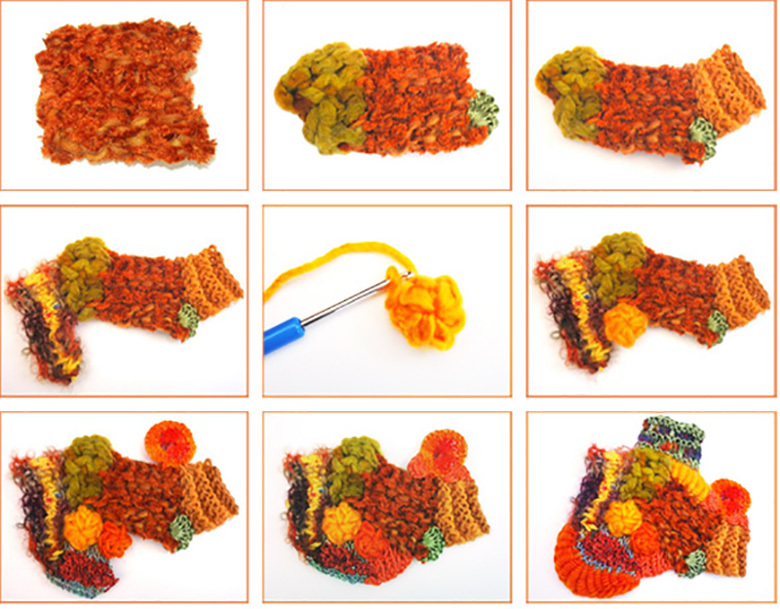 See the Scrumbles Gallery for freeform scrumbles that Prudence has blogged so far!